"My newly acquired Taiga Fleece is just perfect." This pullover is now also available in custom sizes. Specify Body Width and Body Length independently to order a made-to-measure fleece pullover. This tailor-made service can cope with sizes from XXXS to XXXL and is ideal if your chest/waist to height and/or arm ratios differ from standard, ready-to-wear patterns. 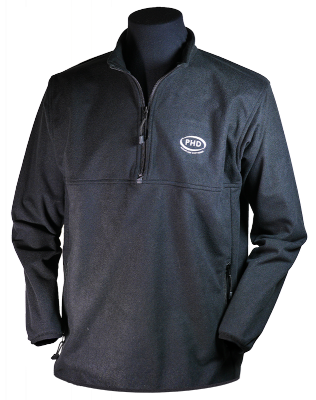 A wonderfully simple and lightweight fleece pullover with superb wind and abrasion resistance. Warp-knit Taiga fleece is lighter and distinctly more windproof than conventional stretchy weft-knit fleeces. Zipped handwarmer pockets, lycra hem and lycra cuffs with thumb-holes complete a comfortable and protective mountaineering layer. This warp-knit fleece is primarily for real activity use rather than the street scene, although its comfort and lightness give little indication of its robust performance. It will resist abrasion and cut the wind far better than normal weft-knit fleeces, shrug off a shower and dry very quickly after a soaking. If work or play takes you out into the elements, take Taiga fleece - you'll notice the difference. Order samples of this fabric & just pay the postage. "My newly acquired Taiga Fleece is just perfect; light, non restrictive and 100% effective. I have played golf all winter with (relatively) cold (-3 once or twice) temperatures, and occasional wet and icy winds, but always been completely comfortable, but with complete freedom of movement. Not your regular market place I know, but thank you very much for a super garment."